KotiLive-raportointiPoker Tours ListWSOP2012 World Series of PokerEvent 27: $1,500 H.O.R.S.E. For the past four days, Event #27 $1,500 H.O.R.S.E. 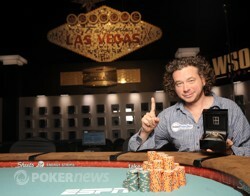 of the 2012 World Series of Poker unfolded as a starting field of 889 players played down until just one remained. That man was Ylon Schwartz, who outlasted 17 other players on Day 3 to capture his first gold bracelet and the $267,081 first-place prize. Day 3 was the scheduled final day, and it began with some stiff competition in the form of Michael Chow, Bryce Yockey, Cliff Josephy, Zimnan Ziyard, Allen Cunningham, Rep Porter and Brandon Guss. Unfortunately for them, none of those players managed to make the final table., including Guss, who began the day second in chips. His demise came in Omaha Hi/Lo when, on a flop, Marlon Milne lead out with a bet and Guss called for most of his remaining stack. He got the rest in on the turn, and was in a bad spot. Guss' pair of sevens had him drawing from behind for his tournament life, and the river was a blank. That locked up the pot and the knockout for Milne, and Guss was dispatched in 11th place. Robby Rasmussen began the final table as the chip leader with 1.25 million, nearly 500,000 more than the next closest competitor. It didn’t take long for the first elimination of the final table to occur, and it happened in Stud Hi/Lo when short-stacked Marlon Milne squared off against Ylon Schwartz. The chips got in on fourth street in heaving raising action, and Milne's two pair had to fade Schwartz's flush draw. It was Milne who drew the clubs on fifth and sixth, and he had the only low draw with one to come. Schwartz rolled his river over first, though, and the was a disaster for Milne. His two pair were suddenly in a big hole, and a blank river would mean his elimination. The was one of those blanks, and that's the one Milne received on seventh, much to his chagrin. The next elimination came in Omaha Hi/Lo when action folded around to Elior Sion in the cutoff and he put in a raise. Jason Brown then moved all in from the small blind for 60,000 total, and Chidwick three-bet from the big blind. Sion not only called the raise, but proceeded to call bets on the flop and turn before folding the river. Chidwick revealed for aces and jacks, which bested his opponent's . Brown shook hands with the remaining players before taking his leave in seventh place. In the last level before the dinner break, Schwartz completed in Stud with the and was raised by David Rogers, who was showing the . The two raised back and forth until Rogers was all in for 146,000 total, and he was in bad shape. While Rogers caught a little help on the turn, he would receive no more as the board ran out dry. Schwartz's kings held up to take down the pot, dispatching Rogers in sixth place for $40,169. When players returned from dinner, it took a two hours for the next elimination to occur. It finally happened in Stud with the limits at 50,000/100,000 when Sion completed with the only to have Rasmussen raise with the . Sion made the call and then led out on the turn. Rasmussen made the call and then raised Scion's bet on fifth street. Sion then three-bet his last 90,000 and Rasmussen made the call. Rasmussen turned two pair and was in the lead, but Sion held kings and had plenty of outs. Unfortunately for him, none would be delivered and he was felled in fifth place for $55,422. Once again, it took awhile for the next elimination, but with the limits so high it was bound to happen, which it did in a new round of Razz. 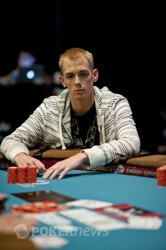 In the hand, Rasmussen completed and was called by David Chiu. Both players had the same hand on the turn, but that didn't stop Rasmussen from betting and Chiu from calling. The same action occurred on fifth street, and then Chiu bet his last 105,000 when he took the lead on sixth. Coincidentally, Rasmussen had the exact same amount and committed it to the pot. "You probably have me," Rasmussen admitted before the cards were turned up. Sure enough, Chiu had a made eight-low and had his opponent drawing dead. Rasmussen, who began the final table as chip leader, finished in fourth place and leaves with a $78,021 consolation prize. The three remaining players could not settle the score. Back and forth they went for hours with each of the three having their hands on the chip lead at one point or another. The pots were huge, and the games were being played at a very high level despite the dwindling average stack size. When the tenth level of the day ended, they were still deadlocked at three. The staff presented them the choice of bagging up right then or playing one more level before calling it a night. 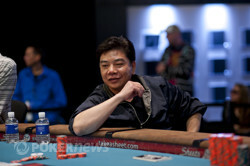 The players chose the former, and they were given a 12-hour recess with Chiu atop the overnight counts. Today was Day 4 of this three-day event, and the finalists returned bright-eyed and bushy-tailed. Chidwick was the short stack left, and he was the first to bow out. It was Omaha Hi/Lo when he fell, going to war with Schwartz on a board. Chidwick had already put 500,000 of his chips into the pot, leaving just 135,000 back. Schwartz made the river bet, and Chidwick tanked for ages before committing himself. The cards were turned up, and it was bad news for the one at-risk. 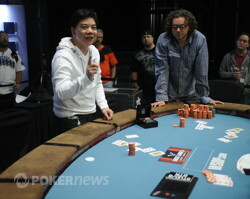 The straight for Schwartz was the winner, and that left he and Chiu heads-up for the bracelet. Chiu was facing a chip deficit to start the duel, but he wasted no time drawing the match nearly square. Schwartz called bets on fourth and fifth, but he raised on sixth. Chiu reraised, but Schwartz came right back with the fourth bet, drawing a curious look from his opponent. Chiu flatted that bet and another one on sixth. On seventh, Schwartz got in a sneaky check-raise, and when Chiu called, he revealed in the hole. Quads! Chiu was reduced to just 200,000 chips — one big bet — and the match was over within minutes. Congratulations to Ylon Schwartz on his fantastic run here in the H.O.R.S.E. race. That does it for our coverage from Event #27 $1,500 H.O.R.S.E. 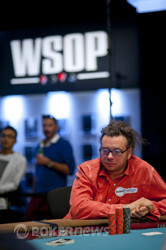 Be sure to visit our live reporting section to follow along with all the 2012 WSOP events throughout the summer. It's over. David Chiu lasted just a few hands with less than a big bet before succumbing. Chiu was drawing from behind with one to come, and he announced his outs verbally as he commanded the dealer, "Nine. King. Ace." Any of those cards would do for Chiu, but he could not find an out. He rolled over the , and once again he broke into a big smile. It was the end of his day, and Chiu gave a big congratulatory handshake to the new champion. The four-time bracelet winner departs with $164,960 as a consolation prize. Schwartz All But Ends It! That was the big one, the pot that contained almost all the chips in play. David Chiu brought it in with the , and Ylon Schwartz completed with the . Chiu called, and off they went to play the biggest pot of the four-day tournament. Chiu bet his lead on fourth street, then again on fifth. Schwartz called the first time, but he raised the fifth-street bet. Chiu reraised, Schwartz made it four bets, and Chiu flatted with a curious look. It took the dealer at least a half-minute or more to pull all the bets into the middle. On sixth, Chiu flatted one more bet, and then seventh street was pitched out. Schwartz squeezed, paused, and checked. Chiu took his cue to make a quick bet, but the surprise check-raise came from across the table. As Schwartz cut the raising chips into the pot, his hands were visibly trembling, something we're not used to seeing from him. Chiu knew something was amiss, but he had to put the last 200,000 into the pot. Call. Schwartz had quads. He showed down / , a monster hand to win a monster pot. Chiu could only smirk at the situation, and he flashed the from the bottom of his hand before slapping his cards down into the muck. After that exchange, Chiu is left with just 200,000 lonely chips. We didn't catch up with the action until sixth street, but things were looking pretty nice for David Chiu. He was showing (in no particular order), while Ylon Schwartz was working with . Chiu bet sixth, and his last bullet on seventh put him nearly all in. Schwartz peeked at his river and let out a big sigh of disgust. "Two kings in the hole?" Chiu asked with a smile. Schwartz returned the smile, but it quickly faded back to a frown. He called, and Chiu revealed that he'd made a nine with . That's very nearly a double-up for Chiu, and he's one pot away from taking the chip lead. Two hands ago, a fold on fifth street left David Chiu with just 585,000 chips. One hand later, Schwartz was forced to do the same thing, and his fold on fifth allowed Chiu to recover the losses from the hand previous. Chiu's jack-low was the best as the hands laid, but Schwartz found a better low on seventh. He pulled a to make the ninety-six, and now it was Chiu sweating for his tournament life. He squeezed the card from the side, and he announced that it was three across. That was a good sweat, but he needed it to be a six or an eight in order to stay alive. It was an ! Chiu can breathe now; he's doubled up with an eighty-seven. 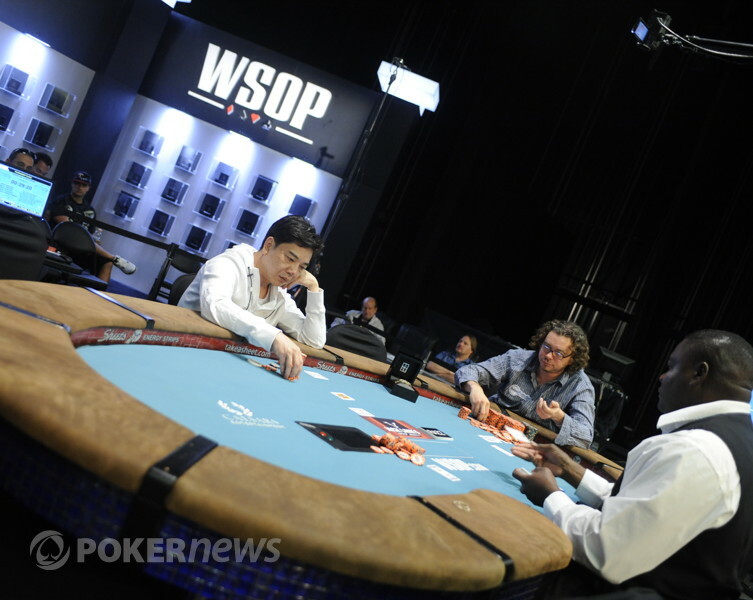 By the way, the bracelet is out on the table, sitting directly in between the two players. David Chiu has four of those already locked up in his safe at home, along with more than $7 million in tournament winnings. A fifth bracelet would put him in some elite company. 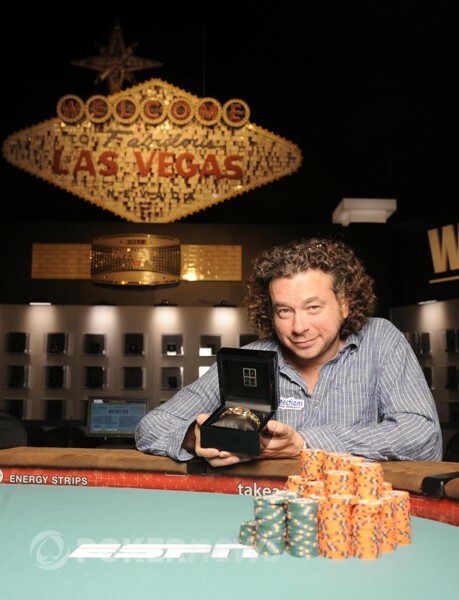 Ylon Schwartz has yet to hoist a bracelet, but he does have more than $4 million in career winnings himself, and he's widely regarded as one of the best mixed-game players in the world. One of those names will be inscribed in the WSOP record books this afternoon. On the second of the heads-up hands, a big pot broke out. We were still tidying up the Chidwick bust-out, but we were listening into the action through fourth street. There was betting and check-raising and reraising, and each player had more well over a million chips in the pot when we scurried down to catch the river action. The board read , and Schwartz made the last bet. By now, Chiu was pretty certain the jig was up, and he made a reluctant call. "Deuces full?" he asked as he did. "You're right," Schwartz complimented. He showed down , and his deuces full were the scooper. Chiu flashed his as he mucked. That was the pot Schwartz needed to gain an edge, and he's really got Chiu on the ropes now. Stephen Chidwick raised from the button, and Ylon Schwartz joined him for a heads-up flop out of the big blind. The dealer spread out , and Schwartz led out with the first bet. Chidwick called there, then called a big bet on the turn. That led them to the river, and Chidwick only had 135,000 chips left in front of him. Schwartz made the automatic bet. Chidwick needed several minutes to think it over, and it was clear that he did not like his spot. Still, he had 500,000 in the pot already, and he couldn't find a fold. There was little choice but to make the crying call. "Straight?" Chidwick asked. Schwartz had it, and Chidwick couldn't beat it. It's been quite a run for Stephen Chidwick, but his run has come to an end in third place. That's good for a six-figure score, and Chidwick and his robust rail have headed off to the cashier to pick up a check.